For many photographers a lighting studio may seem like an unattainable goal. This may well be for cost reasons, for space reasons, or simply because it seems like something which is reserved solely for professionals. However, falling prices and the increasing popularity of ‘pro-sumer’ photography as a result of the advent of digital have meant that a basic lighting studio set-up is within the means of most people. Basic lighting set-ups can be created either with the help of a pre-designed kit bought from a studio manufacturer, or with a bit of DIY. In the first case, your options are fairly broad; several companies make entry-level kits which provide the user with the basis of a fairly respectable lighting rig. Portaflash make the most basic of these kits, one of the best of which includes two lamps (one of which includes various power settings); stands; a brolley; three small reflectors; and a large reflector. 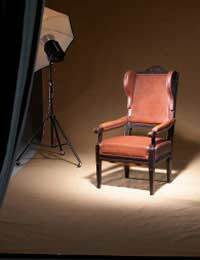 This offers the amateur photographer a considerable proportion of what they would require to learn the basics of studio lighting. Slightly more expensive kits are also available from manufacturers like Photoflex, which might include more powerful lights or better quality diffusers. One of the great limitations of the cheaper kits is that the diffusers that they include (the brolleys and reflectors) tend to be very small. The size of the diffuser being used is directly proportional to the softness of the light, and so you may find that the quality of light that you can achieve with these kits is slightly too hard and slightly too directional. You can, however, purchase separate diffusers which should attach to the kits; the downside here, though, is that the bulbs may not be powerful enough to produce sufficient light once they have been diffused. In these cases, you have two options. In the first case, you could put together your own kit from individual elements; again, companies like Portaflash offer relatively low-cost components that can be pieced together. In fact, most companies produce ‘series’, from which you can pick and choose your components in the knowledge that they will all fit together. Alternatively, you could go down a slightly more DIY route. Many enterprising amateur photographers try to solve their lighting problems with bits that they find around the house, and there is no reason why this can’t produce pretty good results. Any DIY store should offer what will likely be sold as ‘floodlights’ and ‘spotlights’. A combination of these light sources can produce a range of useful effects. The floodlights should, by their nature, already be fairly diffused, but you may still find that they produce too harsh a light. Similarly, the spotlights will almost certainly be too harsh for most photographic purposes. As a result, you have two options; using the money that you have saved on lights, you could buy some large diffusers, or you could make your own. If you choose the former option, you would probably be well-advised to go as large as you possibly can; a few 12-inch brolleys and some large reflectors, for example, can spread the light from industrial spotlights out to an acceptable degree. If you choose to make your own, you will need to find a reflective material (nylon-esque substances tend to be the best), and a way of suspending or attaching your new reflectors. You may well find, however, that once you have factored in the cost of the materials and the time spent building the kit, you would be better off simply buying some ready-made components.